There's nothing that shows the good, the bad, and the weird outcomes of science quite like quinine. If it weren't a centuries-old cure for the world's most feared disease, a lot of people would be dead, a lot of other people wouldn't be dead, the sun wouldn't have risen on the British empire, and your cocktails would taste completely different. Malaria, before the 1600s, killed everyone. It killed people in nearly all regions of the Earth. It killed paupers, merchants, kings, and at least two Popes. Meanwhile, an effective natural treatment was quietly growing in the eastern Andes. Supposedly one person, lost with a malarial fever in the woods, had drunk from a pool surrounded by chinchona trees. The water was bitter, and seemed like poison, but it healed the fever. The trees were used by only local people, until the Jesuits arrived, and noticed that people didn't die of malaria as quickly as they expected and found out why. "Jesuit Powder," as it was called, was exported throughout the world, while the slopes of the Andes were being deforested of the chinchona trees. But the effect of the was limited until Pierre-Joseph Pelletier and Joseph-Bienaimé Caventou, in the mid-1700s, found out what exactly it was that fought the malarial parasite. Forests of chinchona trees were replanted anywhere they would take, and factories set up to extract the powdered quinine from the bark. The powder extended the reach of the medicine, and also extended the reach of those who relied on it. Quinine was distributed among Europeans, primarily, and allowed them to send more people into the tropics than they ever could before. One of the major problems that European powers had with the tropics was the basic one of manpower. People died off faster than they could be replaced. Malaria was a killer, and even those that its spared were often too weak to work. When they came home, they could spread the disease. With the advent of quinine as an easily transportable, reliable treatment, explorers, soldiers, and work forces could live in malarial areas in ways they never could before. Many historians point to quinine as one of the major contributors to colonialism and global empires. But quinine's legacy is not all dark. People began synthesizing other malarial cures in the 1940s, when World War II required a higher production of the stuff in order to protect armies. In the 1960s, with the success of the polio vaccine and the smallpox vaccine, there was hope that these synthesized cures would wipe out malaria. Sadly, parasites began to develop immunity to synthesized drugs, and new drugs were expensive to manufacture. 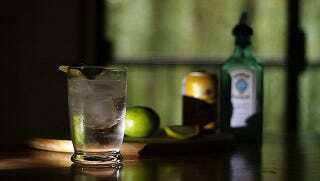 Quinine remains a cheap and effective treatment, and continues to save hundreds of thousands of lives each year. And what about your cocktails? That all goes back to the first story of quinine, with some anonymous man or woman wandering around the Andes, feverish and slaking their thirst in a pool. The bitterness caused them to think they'd been poisoned. Popes, kings, soldiers, workers, and children had the same reaction. The bitter taste in quinine made it extremely unpleasant to drink straight. The accepted practice was to dissolve it in water and alcohol, add a little something else to mask the taste, and then gulp it down. Three centuries of drinking something can give you a taste for it - especially if it has alcohol in it. Any bottle of tonic water you buy today will have a little quinine in it to give it flavor, although you'll have to drink about ten glasses a day to get an anti-malarial dose. Absinthe also is flavored with quinine. Almost everyone who regularly downs drinks in their lives will be getting a hit of three hundred years of scientific discovery. Cheers! Via The Straight Dope, ACS, and CHM.